Taste test: These are very good regular potato chips. Shapewise, they're sort of a mix between a conventionally cooked chips and a kettle-cooked chip. 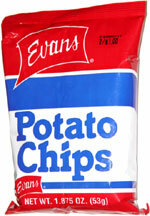 They've got tons of potato taste, not too much salt. There were quite a lot of chips in this smallish, 50 cent bag. A good deal. Smell test: Very potatoey. Good. Company: Service, Sales & Distribution, Inc.